This week the Zionist Federation of the UK and Ireland joined forces with the World Zionist Organisation’s UK delegation headed by Itzhak Sonnenschein, to celebrate the 100thanniversary of the birth of Israel’s 6thPresident, Chaim Herzog. To celebrate the 100thanniversary of Herzog’s birth, the ZF and WZO coordinated a 3-day tour of Northern Ireland and the Republic of Ireland for a delegation, including the 4 children of Chaim Herzog – Isaac, Michael, Ronit and Joel. 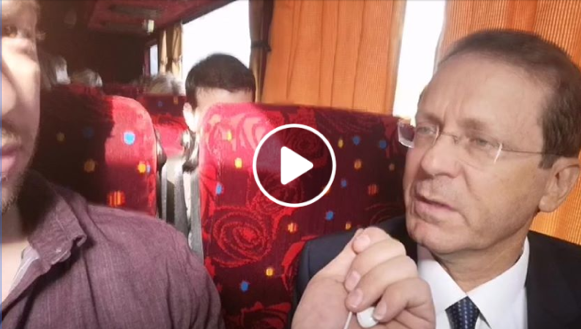 The trip included a visit to the places where Herzog was born and grew up in, as well as seeing the complicated sectarian relationships in Belfast and how it reflects on support for either side of the Israel-Palestinian conflict. As well as events hosted at the Northern Irish assembly (Stormont), the Irish Foreign Office, Belfast synagogue, being hosted by the Irish President and much more, the ZF were very proud to have the opportunity to speak with Isaac Herzog, Haim’s son, former leader of Israel’s opposition, former chairman of the Israel Labour Party, and the newly elected chairman of the Jewish Agency. You can watch the interview by clicking on the image below or here. Whilst visiting Northern Ireland as part of the trip, Israeli Ambassador to the UK Mark Regev spoke at Queens University Belfast, where he was greeted by 20 – 30 protesters chanting “From the River to the Sea, Palestine will be free”. These protests were met by the support of the Student Union. However whilst the protesters were chanting and singing outside, the Ambassador held a positive and productive dialogue with Masters and Doctorate students of the University, discussing the possibilities for peace.